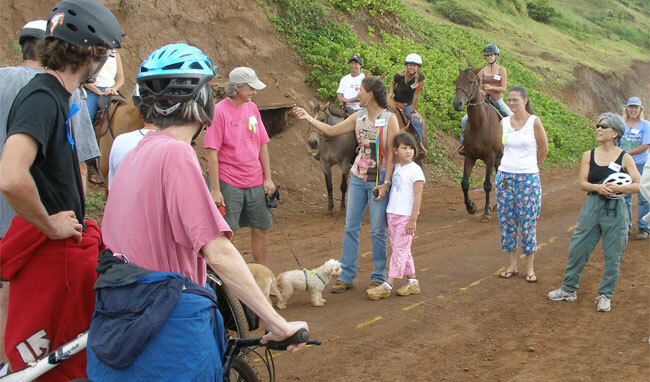 The Kauai county council has, by a vote of 6-0, approved resolution #2008-44: "To support efforts by the State of Hawaii, county of Kauai, and other stakeholders to improve bicycle safety in the county of Kauai." 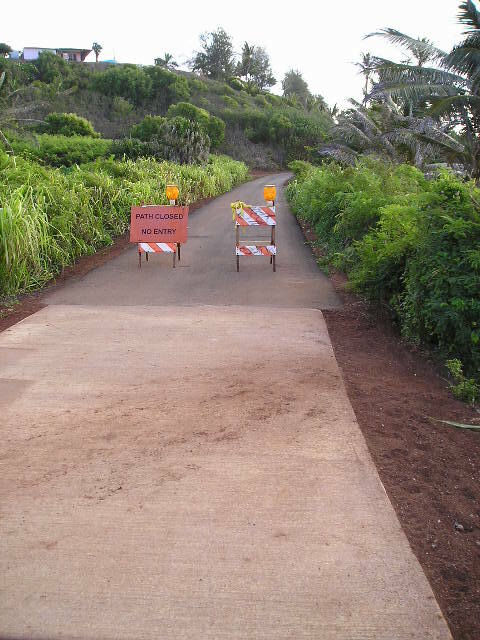 "WHEREAS, bicycling is an activity with many benefits for individuals and the community..."
Another ride northward: the remaining portion of the Path north of Kealia Beach has been paved, but is still not open and under construction. The concrete has been poured up to, and immediately north of, the new bathroom at Kealia Beach. Beyond that asphalt has been layed in an effort to cut costs. From this point on, the path is considered closed (for now). 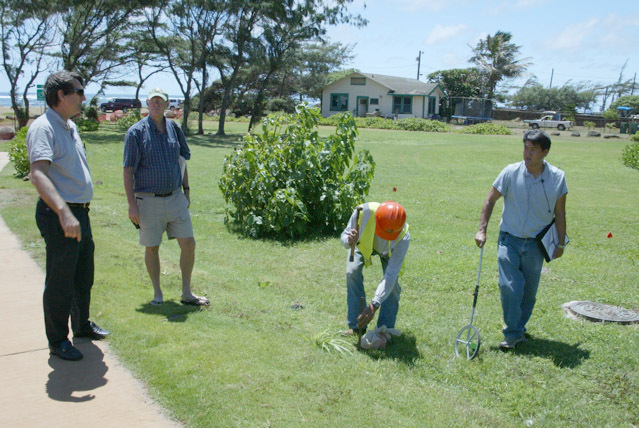 August 19, 2008: Public Works' Building Division Chief Doug Haigh got together with Kauai Path's Secretary Thomas Noyes, Operator / Lead Man Roscoe Uyeda (in the hard hat), and Mark Nishida, Project Manager in charge of the construction of Phase II of Ke Ala Hele Makalae by Jason Glover, Ltd. to choose locations for the trail head signage. To send us and e-mail go to the contact us page. To download a .pdf of this flier, click here. 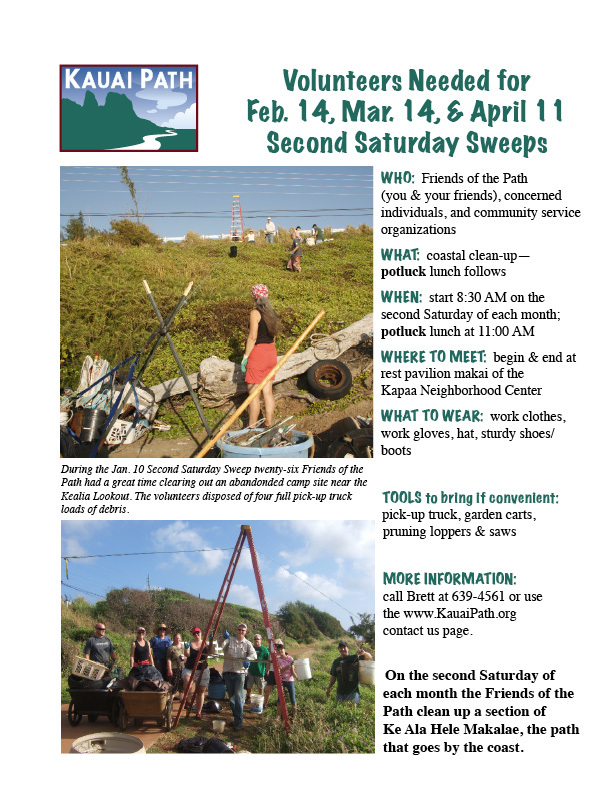 Please help malama Ke Ala Hele Makalae on the Second Saturday of each month. 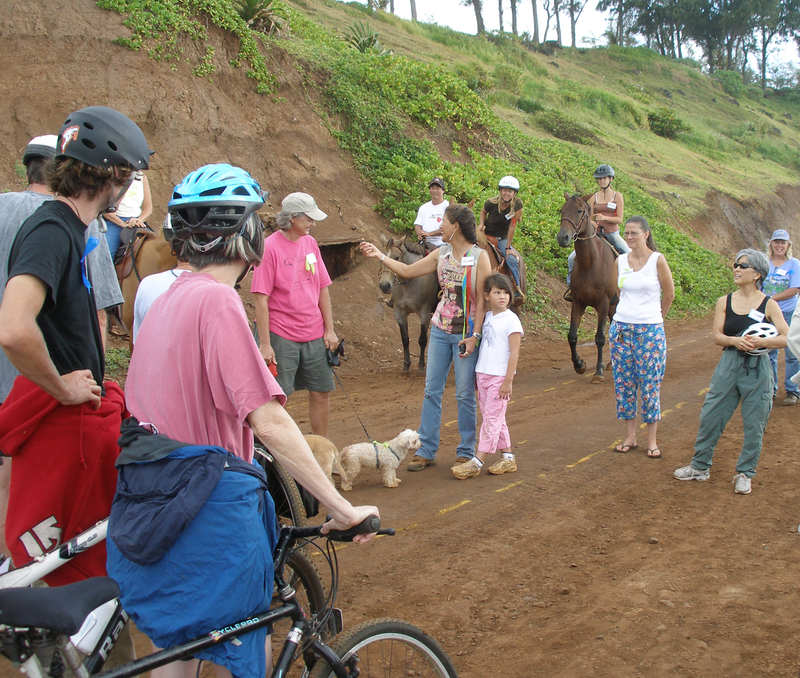 Meet at the rest pavilion makai of the Kapaa Neighborhood Center. What to bring: gloves, broom, hat, water, shoes recommended. Pot luck lunch follows. Check with Friends of the Path coordinator Brett Ishida for scope of work—639-4561 or contact us with your questions or to register. A six-minute video hosted by Ron Wiley showing progress on Phases I and II (partial) of Ke Ala Hele Makalae. Download a high resolution JPEG of this photo here. Dr. Leilani Sim-Godbehere, DVM interviewed Dr. Becky Rhoades, DVM and director of the Kauai Humane Society early on Sunday morning September 24, 2006, as twenty-eight citizens enjoyed walking their dogs and riding on Kealia Cane Haul Road while gathering video testimony regarding a bill that was later heard before the County Council.